Situated in the middle of Muskoka, Bracebridge is a fantastic location to live all year round. With homes on and off our many waterways and easy access to Barrie and Toronto for shopping and the international airport less than 1.5 hours away for that mid-winter get away, you can have the best of everything right here. There is perhaps no better example of that than the many fun celebrations that occur around Canada Day. The festivities are all launched from Bracebridge Bay Park and Kelvin Grove Park located on both sides of the river, just below the Silver Bridge over the falls on Ecclestone Rd. Events include cardboard boat races, rubber duck derby and of course fireworks! There will be a beer tent, sponsored by Muskoka Brewery and live music sponsored by the Chamber of Commerce which start at 6:00 p.m. Rest assured there will be food vendors too so plan on being there for some dinner. Activities begin at 8:00 p.m. with the boat races, followed at 9:00 p.m. by the duck race, culminating at 10:00 p.m. with the fireworks. If you are planning some home based family events in the evening then why not drop into the Bracebridge Visitor Information Centre (1 Manitoba St.) for some Canada Day Cake which is being served starting at 2:00 p.m. Cake is free while supplies last. Bracebridge is a lovely place to live in or cottage around so if you are planning fireworks at your home or cottage please check with the fire department to ensure you can and follow these simple safety tips to protect your family, your property and our beautiful Muskoka! Keep sparklers away from children. 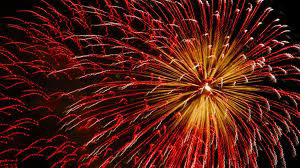 Sparklers burn extremely hot (1200oF – which is hotter than the temperature required to melt glass!) and can ignite clothing, cause blindness and result in severe burns. As the sparkler wire remains hot for some minutes after burnout, it should be immediately soaked in water to avoid injury. Enjoy your Canada Day and remember that I am always available to assist your with all your Real Estate needs. Whether you intend to buy or sell property in Bracebridge or surrounding area or just want some advice on a renovation project or an opinion of your property’s current market value, I am happy to help. Gross Grout in your Muskoka Cottage or Home? Is your GROUT grossing you out? This solution should help make it look great again. If your home or cottage has tile, marble or stone used for flooring, countertops or back splashes then you have grout! Whether it is in the bathrooms, or kitchen or entrance foyer, grout can be a major challenge. Grout is porous in nature, if it is unsealed or not regularly re-sealed, it can absorb all kinds of stains; mud form your boots, dirty doggy paws, spilt coffee or wine (Who would spill good wine?) or even worse mildew and a multitude of other things can grow it in when it is damp. This can make your rooms appear dirty, even if you’ve just freshly cleaned. Fortunately, the following process should remove most household stains from your GROUT. This is a relatively safe procedure with components that will not pose a health threat to you if used in accordance with the directions, however, it is a procedure that requires rubbing a tooth brush into the grout and so it is best to protect your eyes from any splashing and your hands from prolonged exposure. Thoroughly clean the surface of the GROUT. Remove any residue or debris, and then let it dry fully. Add 2 tablespoons of oxygenated bleach to 2 cups of warm water. Stir till dissolved. Use the toothbrush to apply the mixture to the GROUT. After letting it soak in, scrub the GROUT in a circular motion. This looses the stain better than scrubbing back and forth. A thicker paste can be made if needed by dipping the wet toothbrush in the oxygenated bleach. Wipe the GROUT clean and let it dry completely. For extra-dark stains, try squeezing the juice from a lemon** onto the stain. Let it soak then repeat Steps 4 & 5 from above. Make sure your hard work has paid off. Spray the tiles and GROUT with cleaning spray, and then wipe them clean. 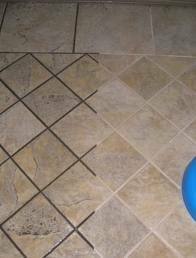 Allow the GROUT to dry thoroughly as damp grout looks darker. Finish by applying a GROUT sealer to prevent future staining. Make a note to re-apply yearly perhaps when you are changing the batteries in your smoke detectors. * Unlike bleaching agents that can harm GROUT, oxygenated bleach is safe even for coloured GROUT. ** Don’t use too much lemon juice on marble as it can etch the stone if left on too long. A safe alternative is hydrogen peroxide. *** Some stains may need more elbow grease, a coarser brush, longer soaking, repeated treatments, or a commercial tile & grout cleaner to get the GROUT sparkling clean. Taking care of your Muskoka cottage or home is like putting money in the bank. Scheduling grout maintenance on your calendar once a year will reap rewards and it will make you feel good too. And remember to imbibe the wine! Don’t waste it on your counters or floors.